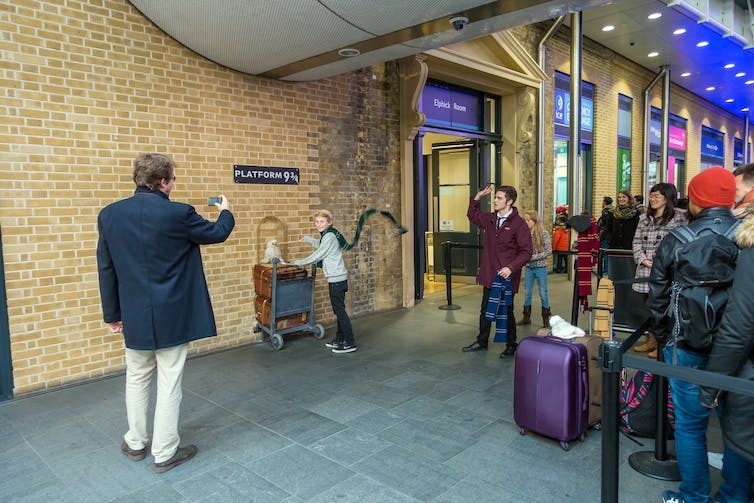 Platform 9 and ¾, the portal to Harry Potter’s magical world, at Kings Cross in London. I recall the long periods of frustration and excited anticipation as my son and I waited for each new instalment of the series. 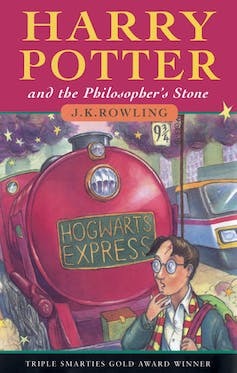 This experience of waiting is one we share with other fans who read it progressively across the ten years between the publication of the first and last Potter novel. It is not an experience contemporary readers can recreate. Assessing the series’ literary merit is not straightforward. 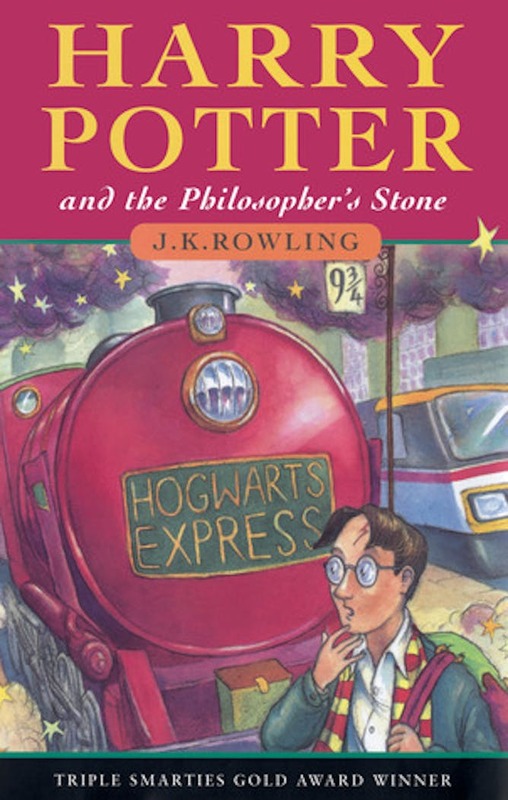 In the context of concern about falling literacy rates, the Harry Potter series was initially widely celebrated for encouraging children – especially boys – to read. The books, particularly the early ones, won numerous awards and honours, including the Nestlé Smarties Book Prize three years in a row, and were shortlisted for the prestigious Carnegie Medal in 1998. 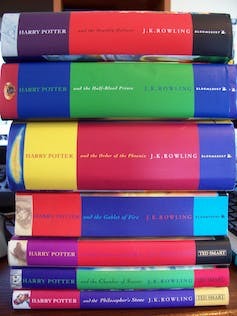 The seven books of the Harry Potter series, released from 1997 to 2007. Criticism of the literary merit of the books, both scholarly and popular, appeared to coincide with the growing commercial and popular success of the series. Rowling was criticised for overuse of capital letters and exclamation marks, her use of speech or dialogue tags (which identify who is speaking) and her use of adverbs to provide specific information (for example, “said the boy miserably”). 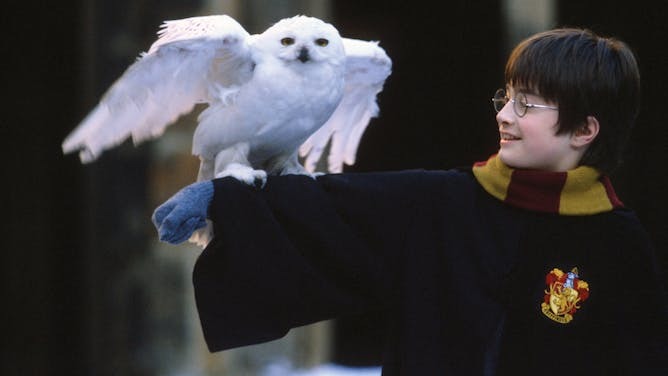 Daniel Radcliffe in his first outing as Harry Potter in the Philosopher’s Stone, 2001. Books for younger children may seem simple and conventional when judged against adult standards. The use of speech tags in younger children’s books, for example, is frequently used to clarify who is talking for less experienced readers. The literary value of a children’s book is often closely tied to adults’ perception of a book’s educational value rather than the pleasure children may gain from reading or engaging with the book. For example, Rowling’s writing was criticised for not “stretching children” or teaching children “anything new about words”. Many of the criticisms of Rowling’s writing are similar to those levelled at another popular children’s author, Enid Blyton. Like Rowling, Blyton’s writing has described by one commentator as “poison” for its “limited vocabulary”, “colourless” and “undemanding language”. Although children are overwhelmingly encouraged to read, it would appear that many adults view with suspicion books that are too popular with children. There have been many defences of the literary merits of Harry Potter which extend beyond mere analysis of Rowling’s prose. The sheer volume of scholarly work that has been produced on the series and continues to be produced, even ten years after publication of the final book, attests to the richness and depth of the series. A focus on children’s reading pleasure rather than on literary merit shifts the focus of research to a different set of questions. I will not pretend to know why Harry Potter appealed so strongly to my son but I suspect its familiarity, predictability and repetition were factors. These qualities are unlikely to score high by adult standards of literary merit but are a feature of children’s series fiction. Great article! Love this message!